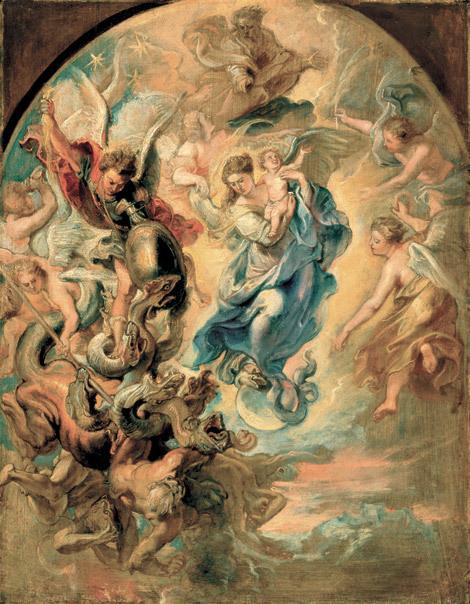 In the Book of Revelation, the “great portent” of the “woman” (12:1) is accompanied by ‘another portent which appeared in heaven’: ‘a great red dragon’ (Rev 12:3), which represents Satan, the personal power of evil, as well as all the powers of evil at work in history and opposing the Church’s mission. Here too Mary sheds light on the Community of Believers. The hostility of the powers of evil is, in fact, an insidious opposition which, before affecting the disciples of Jesus, is directed against his mother. To save the life of her Son from those who fear him as a dangerous threat, Mary has to flee with Joseph and the Child into Egypt (cf. Mt 2:13-15). Mary thus helps the Church to realize that life is always at the center of a great struggle between good and evil, between light and darkness. The dragon wishes to devour ‘the child brought forth’ (cf. Rev 12:4), a figure of Christ, whom Mary brought forth ‘in the fullness of time’ (Gal 4:4) and whom the Church must unceasingly offer to people in every age. It is precisely in the “flesh” of every person that Christ continues to reveal himself and to enter into fellowship with us, so that rejection of human life, in whatever form that rejection takes, is really a rejection of Christ.